An earlier design of the park pavilion. This may go away as part of the scaling back decision. 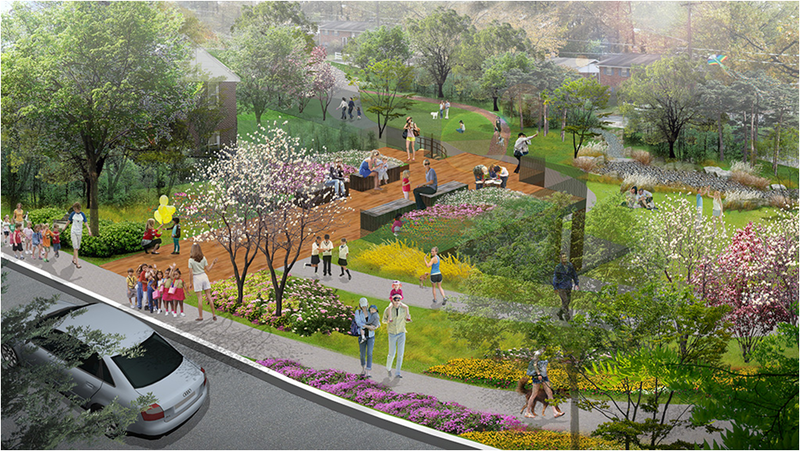 At last night’s meeting, the City Council decided to scale back the Gateway Park project. Though the Council decided to fund the park fully, strangely enough, it then decided to scale down the Park’s amenities. The outcome is rather disappointing, given the fact that the Council has consistently supported the design of the park project that is now near to completion and we’re ready to break ground. The implication of the last night vote is uncertain and very vague. One idea floated was to get rid of the pavilion that could be used as an educational venue and gathering place for residents. Strangely enough, if we don’t build it, the CBT grant fund ($150K) that was thought to be used for this amenity cannot be used for any other project. In other words, this money will be lost. The City renewed the funds recently and is set to expire in September. The Council will discuss more at its July 5 meeting more about the project’s new scope. It was rather disappointing to see the park is going to get scaled back. We always complain that the north College Park doesn’t get much. Now we’ve all the funds for amenities that our resident could enjoy, sadly we decided to not have it. Thanks to many residents who came out to last night’s Council meeting. I believe around 12 residents spoke – all in favor of the park. Also, thanks to you all who wrote to us about the park. THANK YOU!